Wow, Sydney! How warm has it been this winter! While I’m usually quite fond of the cooler weather that our winter brings, I’ve found that these unseasonably warmer temperatures are the perfect excuse to make popsicles. I recently discovered Zip Pops, which provide a healthy alternative to those unnaturally colored icy poles available at the grocery store. They are wonderful; I absolutely love them! It’s just like eating one of those naughty icy poles, except they’re homemade with your own fresh ingredients so you know exactly what’s in them. I’ve been trying out a few recipes and my recipe testers and I have came up with a few favorites. I’ve been posting pictures of them on my Instagram feed from time to time, and I’ve decided I finally need to get a recipe up so you can enjoy them as well! Today, I’m sharing the recipe for these vanilla matcha latte popsicles. They’re made with 5 ingredients and are so easy to throw together. There are two ingredients in these popsicles that can really make or break the flavor – first, the matcha. Use high quality, bright green, soft and powdery matcha for the best results. Second, the yoghurt. Choose a high quality, creamy yoghurt that you enjoy eating on its own. This ensures the frozen popsicle will taste amazing! 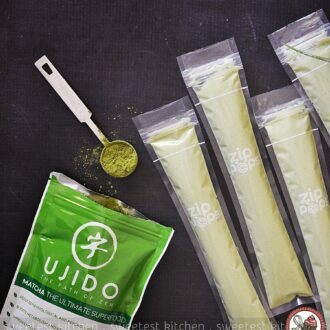 I’ve used Ujido matcha in these popsicles. 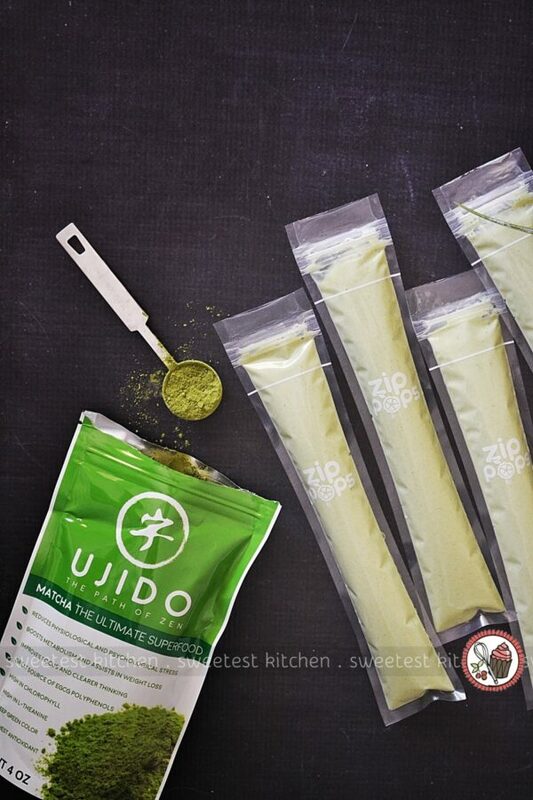 Ujido recently sent me a package of their green tea to try and I can honestly say I love it! It’s beautifully green and tastes so lovely. I highly recommend it to use in this recipe. Ujido has been producing matcha for 180 years in Uji, Kyoto, using traditional methods – even hand-picking every single one of the tea leaves that goes into their matcha (they only pick the youngest, smallest and greenest leaves)! How amazing is that, and their high attention to detail and quality results in some of the finest matcha in the world. Let’s talk yoghurt now. You can use either Greek yoghurt or normal yoghurt in this recipe – whichever you prefer. But it has to be thick, creamy and delicious. I’ve used Farmer’s Union vanilla bean Greek yoghurt, as well as Gippsland smooth and creamy yoghurt, and both are delicious. I like using whole milk yoghurt, but you can use low fat or no fat if you like. If you don’t have vanilla-flavoured yoghurt, you can use whatever you can find/have and just add pure vanilla extract (and extra honey, if needed). If you happen to not like yoghurt at all, you can try replacing the yoghurt with any milk of your choice (coconut, almond, cow’s, etc.). I haven’t yet tried this, but apart from resulting in a different texture, it should work just fine. Just be sure to taste it before pouring into the Zip Pops, and adjust the levels of the other ingredients as you like. 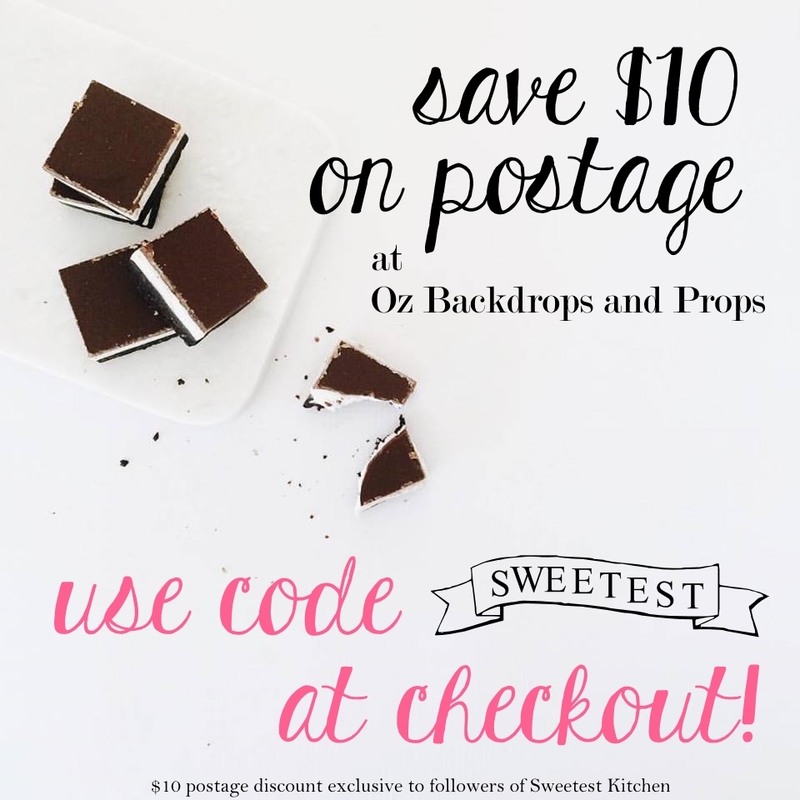 You can use any type of sweetener, you like, too, by the way. To bring these pops together, my recipe uses 1.5 cups of vanilla yoghurt, 1.5-2 tablespoons of honey, 1/2 teaspoon of pure vanilla extract, 1/4 cup milk (any kind of milk works here) and 1/2 tablespoon of matcha. Whisk together the yoghurt, honey and vanilla until combined. Then, add the milk to the yoghurt mixture and sift in the matcha. You need to sift the matcha to ensure it all dissolves well. Whisk until the matcha is dissolved and the yoghurt mixture is a gorgeous light green color. 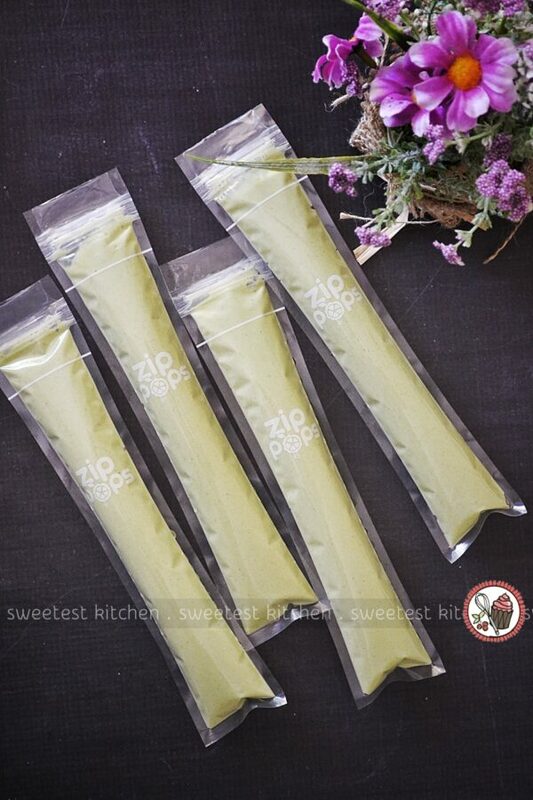 In order to easily pour the mixture into the small opening of the Zip Pops, the mixture should be of a pourable consistency. You can add a little more milk if you need to, as the mixture’s thickness depends on the thickness of the yoghurt (so if your yoghurt is extra thick, you may need to add a little more milk). If you can resist eating this straight from the mixing bowl, pour the mixture into the Zip Pops (you’ll need a funnel for this step, or at least I’ll just highly recommend one!) up to the fill line. Remove the funnel and seal the Zip Pop. 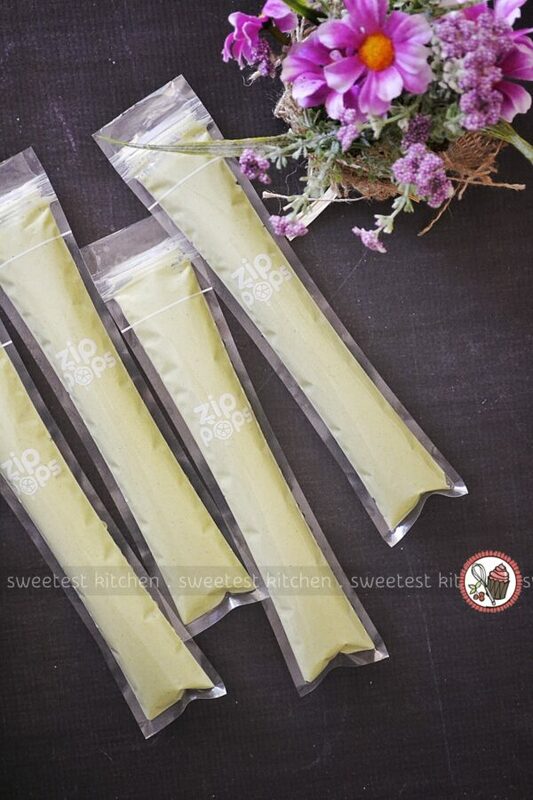 Place the Zip Pops upright in the freezer and freeze for 4-6 hours. Once they are frozen, you can store them lying flat. 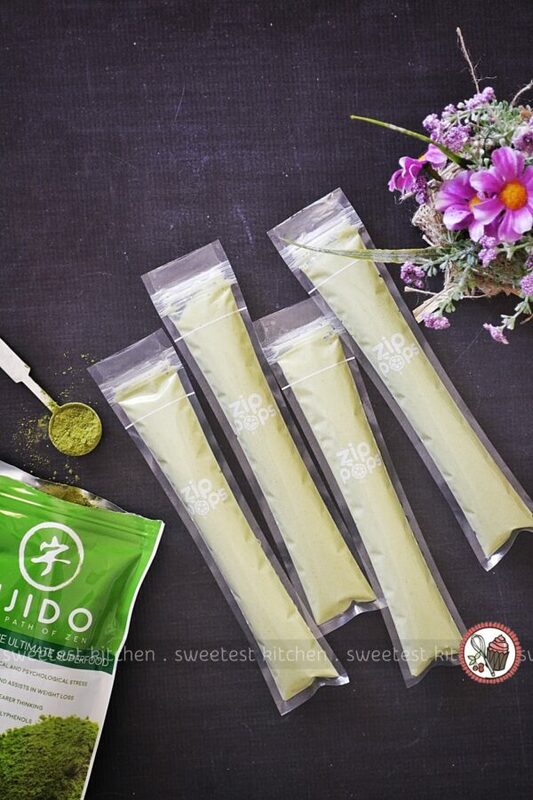 To enjoy your vanilla matcha latte popsicles, you can open the seal and push the popsicle up, but we opt for the easy, lazy way and just snip off the top, under the seal. The Zip Pops are reusable, but in all honesty, they’re not the easiest thing to clean and dry on the inside! 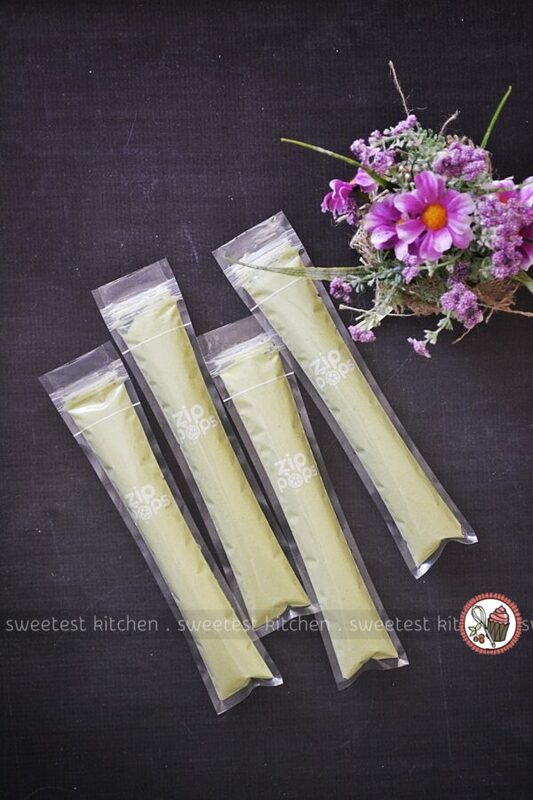 These vanilla matcha latte popsicles are so delicious and refreshing, with the lovely green taste from the matcha, the tang from the yoghurt and the gorgeous sweetness from the vanilla. These are definitely an anytime treat, from breakfast, all the way through to a late night dessert. They’re also the absolute perfect afternoon pick-me-up (replace a cup of coffee or an afternoon snack with a vanilla matcha latte pop!). If you love these Zip Pops as much as I do, follow me on Facebook and Instagram, add my blog to your RSS feeds, or anything you like to do to stay up-to-date with your favorite blogs, because I have some more recipes coming up soon plus a Zip Pops giveaway! Made with creamy vanilla yoghurt and antioxidant-packed matcha, these healthy vanilla matcha latte popsicles are the perfect treat for anytime of the day! In a medium mixing bowl, whisk together yoghurt, 1½ tablespoons honey and vanilla until thoroughly combined. Add milk to the yoghurt mixture, and sift in matcha powder. Whisk again until the matcha is dissolved and the mixture turns a lovely light green color. Ensure the mixture is of a pourable consistency in order to easily pour into the small opening of the Zip Pop moulds. You may need to add a little more milk to thin it out, depending on the thickness of your yoghurt mixture. Taste the mixture, and add a little more honey, if desired. Using a funnel, pour the mixture into the Zip Pop moulds up to the white fill line. Freeze the moulds upright in the freezer for 4-6 hours. Once frozen, you can lay the popsicles flat for storage. * You can make this recipe vegan by omitting the yoghurt, honey and milk. Simply replace the yoghurt with an equal amount of your choice of milk - coconut, almond, etc. Replace the honey with maple syrup, or your choice of sweetener. Omit the ¼ cup milk in the recipe entirely. Note that using different milk and sweeteners will result in a different taste than my recipe intended, but it should still taste nice. Be sure to taste and adjust the mixture before pouring into popsicle moulds. * You can use any type of yoghurt you like in this recipe. The thicker and creamier, the better. Be sure to taste the mixture before freezing and adjust the amount of honey, vanilla and/or matcha as desired. * This recipe only makes 5 Zip Pops, but you can easily double all of the ingredients to make an extra 5 popsicles.